Sleek, understated styling in and out. Handles and drives like a slightly smaller, lighter vehicle. Still not small or light. Sleek and understated may also be bland. Mazda’s lofty claim that a seven-seat, 4,000lb pseudo-truck is designed to handle well is not far from saying a sumo wrestler was trained as a ballet dancer—it might be true to some degree but you still shouldn’t get your hopes up. And this definitely applies to the CX-9. With big wheels and tires, tall ride height and seating position, there’s no denying that you’re behind the wheel of an SUV–body roll and brake dive are still present–but Mazda worked hard to sharpen the reflexes of the CX-9 to a more acceptable level. Good visibility and a better-than-average sense of where the CX-9’s corners are help with tight mall parking situations. Compared to many vehicles in this class, the CX-9 felt almost as smooth and plush but notably less cumbersome. 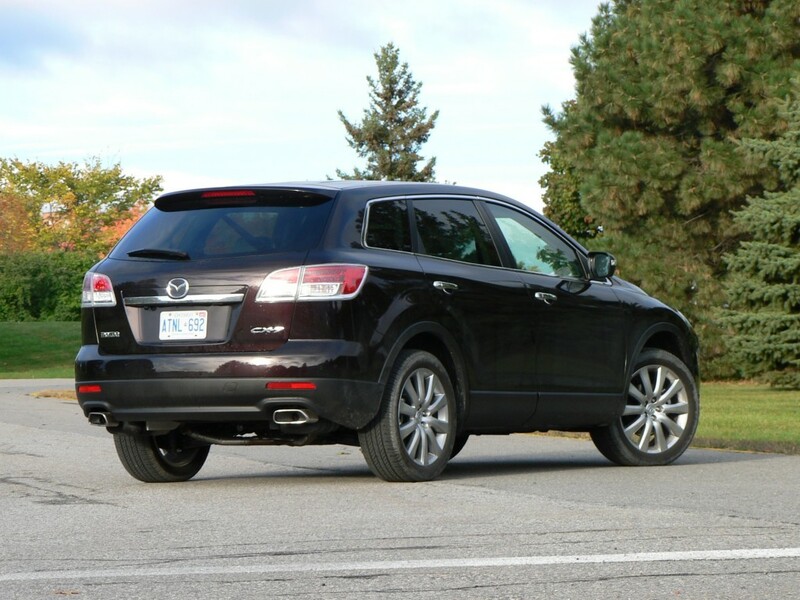 We’re generally impressed with Mazda build quality and the CX-9 is no exception. There’s not much on this car that hints at cost cutting. Doors close with a muted, health thump. The ride is quiet with no wind noise or rattles, and the engine noise, though noticeable when driving hard, is a pleasing tone. Interior materials are all good choices, though the leather seats feel somewhat rubbery. With this much room it’s no surprise that the spacious CX-9 is plenty comfortable. The seats are flat and only semi-supportive in terms of bolstering, but that’s what you’d expect for a vehicle in this class. There’s room to improve in the ergonomics department, as my average-length arms had to stretch to reach many of the center dash controls. Storage options were quirky, with a surprising lack of cubbies for wallets and phones, and center console doors that open outwards towards the occupants, making access awkward. Under the hood lurks a smooth-running V6 that churns out 273hp and 270ft/lb of torque. A 6-speed automatic transmission is quick to downshift and happy to hold a gear up to the 6,000rpm redline. There’s a manual shift mode but it’s sluggish and not worth the trouble. The engine and transmission connect to an all-wheel-drive system that lends confidence on wet or snowy roads. Between the torque, gearing and AWD system you can mash the throttle and trust the CX-9 to dart into traffic with nary a hint of wheel spin or drama, and for a large vehicle it packs a surprising punch that compliments the tight chassis well.